The chances of the Indians trading one of Corey Kluber or Trevor Bauer “seem to diminish by the day,” writes Ken Rosenthal of The Athletic in his latest notes column (subscription required). Rosenthal writes that Cleveland is instead looking at affordable options to round out the back end of the roster more than moving either of the oft-rumored-to-be-available righties. As MLBTR’s Ty Bradley recently noted in profiling the remaining needs of the American League Central’s five teams, the Indians could still use some outfield upgrades as well as help in the bullpen and behind the plate. Adding some veteran versatility for the bench could also prove prudent in Cleveland, where Jordan Luplow, out-of-options Max Moroff and non-roster invitee Mike Freeman are currently among the candidates for bench roles. The Twins obviously plan to use Nelson Cruz primarily as a designated hitter, but manager Rocco Baldelli at least raised the possibility that Cruz could see occasional outfield work in 2019, as Phil Miller of the Minneapolis Star Tribune writes. “We’re going to work with him and have a lot of conversations about how he is doing,” said Baldelli. “How he feels. How he prepares for the season to play in the outfield.” Presumably, Cruz would be more of an emergency option or perhaps an option in National League parks during interleague play. Minnesota, after all, isn’t short on young, athletic outfield options with Eddie Rosario and Max Kepler currently in line for the bulk of the corner outfield work, plus Byron Buxton and Jake Cave in the center field mix. Miller also quotes Cruz on his decision to sign in Minnesota, which was influenced in part by his familiarity with GM Thad Levine and former Orioles teammate/new Twins second baseman Jonathan Schoop. Meanwhile, Rosenthal adds that Cruz did receive two-year offers in free agency, but none that would’ve come close to the $26MM he can earn if the Twins exercise his 2020 option. The Rays and Astros were among the other teams prominently linked to Cruz in free agency. Chris McCosky of the Detroit News chats with Tigers prospect Bryan Garcia, who is now 11 months removed from Tommy John surgery and is nearing a return to the mound. As McCosky notes, the Detroit farm system looks dramatically different now than it did a year ago, when Garcia was ranked among the organization’s more promising young arms. MLB.com still ranks Garcia as the Tigers’ No. 22 farmhand, but he’s been leapfrogged by numerous pitchers over the course of the year he missed. None of that bothers Garcia, who discusses his decision to undergo surgery, his mindset during rehab and his 2019 outlook at lengthy with McCosky. A sixth-rounder in 2016, Garcia enjoyed a meteoric rise through Detroit’s system in ’17, ascending from Low-A to Triple-A and amassing 55 innings of 2.13 ERA ball with 12.8 K/9 against 3.6 BB/9 along the way. Tigers VP of player development Dave Littlefield tells McCosky that the goal is for Garcia to be pitching competitively by May. The 23-year-old could well emerge as a ’pen option in Detroit in late 2019 or in 2020, though Fangraphs’ Eric Longenhagen wrote last May that Garcia could also have the stuff to start. TODAY: The Twins have officially announced Cruz’s signing. DEC.27: The Twins are in agreement on a contract with free-agent slugger Nelson Cruz, reports Jeff Passan of Yahoo Sports (via Twitter). It’s a one-year deal with an option for a second season, according to Fancred’s Jon Heyman (on Twitter). Enrique Rojas of ESPN Deportes further reports that Cruz will earn $14MM in 2019, and the contract contains a $12MM club option with a $300K buyout (Twitter link). Cruz is represented by the Primo Sports Group. Cruz, 38, was frequently linked to the Twins throughout the offseason. Minnesota stood out as a logical landing spot for the ultra-consistent slugger, as one of the few teams with a clear vacancy at designated hitter following the retirement of Joe Mauer and the decision to decline a club option over Logan Morrison. That pairing of Mauer and Morrison, then, will be swapped out for a more powerful combo of Cruz and C.J. Cron, whom Minnesota picked up from the Rays earlier this offseason. Although he’s well into his late 30s, Cruz has shown little to no semblance of decline. 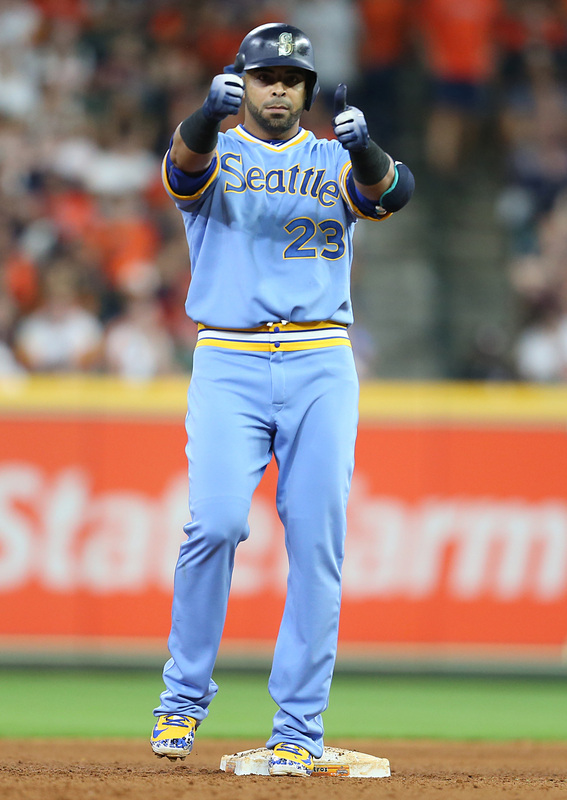 His four-year, $57MM contract with the Mariners raised some eyebrows initially, but he not only lived up to every bit of that deal but actually provided Seattle with a fair bit of excess value. Over the life of that four-year pact, Cruz raked at a .284/.362/.546 pace despite playing half his games at Seattle’s pitcher-friendly Safeco Field. Cruz’s .256/.342/.509 batting line from 2018 was the weakest output of his four seasons in Seattle, but that was largely attributable to an uncharacteristic dip in his average on balls in play (.264 in 2018; .305 career). That BABIP drop came despite the fact that Cruz actually increased his hard-hit rate over his 2017 levels. Adding Cruz will presumably push fellow righty slugger Tyler Austin into a bench role; the 27-year-old Austin showed huge power with the Twins following a midseason acquisition but remained strikeout-prone and OBP challenged. He can spell either of Cron or Cruz from time to time and has some corner outfield experience in the minors as well. Of course, Sano’s status is one of the true mysteries for Minnesota heading into 2019; a fractured shin suffered by Sano late in 2017 ultimately led to offseason surgery that saw a titanium rod inserted into his leg, which prevented him from a full offseason of conditioning. If the lingering effects of that surgery are behind him and Sano can return to something approximating his 2017 levels of production, the Twins will possess a trio of right-handed sluggers to pair with lefty-swinging Eddie Rosario. Given the uncertainty surrounding Sano, Byron Buxton and fellow free-agent signing Jonathan Schoop, adding a player with Cruz’s perennial stability is all the more important for the Twins. Financially speaking, the Twins can easily afford to add Cruz at $14MM for the upcoming season and still make additional moves. Cruz’s contract will boost the Twins’ 2019 payroll to just north of $100MM — a mark that is well shy of both the $112.6MM they’ve averaged over the past four seasons and the $128.7MM payroll they carried into the 2018 season a year ago. Beyond that, the fact that Cruz was added on a one-year guarantee means that the Twins still don’t have a single guaranteed contract on the books for the 2020 season, leaving them with more flexibility than any team in the Majors from a long-term vantage point. Further additions would appear prudent for Minnesota. Though the Twins had a disappointing 2018 season, the American League Central still looks quite weak. The Tigers are still in the midst of a full-scale rebuilding effort, and though the Royals have indicated that they’ll aim to be more competitive in 2019, they’re in a largely similar situation. The White Sox have been rebuilding for a longer period of time and are showing signs of pushing closer to contention, but the 2020 season likely presents a more realistic timetable for the South Siders. Even the Indians, who have won three consecutive division titles, have weakened their roster to an extent this offseason, which at least creates an opportunity for the Twins to make another relatively surprising run. They’ll need bouncebacks from Sano and Buxton and could stand to further augment the pitching staff, though as noted above, they certainly have the financial resources available to make those moves. Prior to this morning’s agreement with the Twins, slugger Nelson Cruz received “competitive” offers from both the Rays and Astros, according to Juan Toribio of The Athletic (Twitter link) and Fancred’s Jon Heyman (Twitter link). Specifics aren’t known, but it seems likely that the Twins would’ve had to outbid either by a fairly notable margin, given that the Rays won 90 games last season while the Astros won the 2017 World Series and appeared in a second consecutive American League Championship Series this past season. Minnesota ultimately secured Cruz with a $14.3MM bid that includes a $14MM salary for the 2019 season and a $12MM club option ($300K buyout) for the 2020 campaign. If Houston or Tampa Bay is still keen on adding a notable right-handed bat, there should be numerous options in play. The rebuilding Tigers, for instance, would likely be willing to move Nicholas Castellanos as he enters his final season of club control. The Cardinals, meanwhile, could move Jose Martinez to an American League club that’d be better suited to mask his defensive shortcomings at the DH spot. The Cardinals have been an oft-speculated landing spot for Bryce Harper but have not been rumored to have any meaningful interest in the market’s top free agent. Derrick Goold of the St. Louis Post-Dispatch explored the situation in his latest Q&A with readers, explaining the numerous reasons that the Cardinals feel a pursuit of Harper would differ from their prior pursuits of huge contracts for David Price, Jason Heyward and Giancarlo Stanton. Above all else, it seems that the sizable discrepancy between Harper’s asking price and even those other substantial contracts is a roadblock for the St. Louis front office. The Cards also don’t have the personal connection with Harper that they had after a year of having Heyward in the clubhouse, and they’re generally averse to the leverage that opt-out clauses provide players on lengthy free-agent deals. In an appearance on MLB Network’s Hot Stove this morning, Anthony Castrovince of MLB.com downplayed the possibility of the Indians trading a top starter (video link). “I don’t think it’s particularly likely they move either Corey Kluber or Trevor Bauer at this moment,” said Castrovince, citing sources with the Indians. While he cautioned that things can change with a single call or text, the roughly $21MM saved in trades of Yan Gomes, Edwin Encarnacion and Yonder Alonso has alleviated pressure to pare back payroll from its record levels in a 2018 season that saw the total attendance decline. That, of course, doesn’t mean rumors or conversations surrounding Kluber will cease — they assuredly will not — but it’s worth keeping in mind when parsing the inevitable continuation of Kluber rumblings. More than 18,000 readers voted in last night’s MLBTR poll asking whether Cleveland would actually trade Kluber, and the response was a near-even split (52-48 in favor of Kluber being moved). The White Sox, Red Sox and Rockies are all maintaining some level of interest in free-agent reliever Adam Ottavino, tweets Jon Morosi of MLB.com. As one of the top relievers on the market, the 33-year-old Ottavino should have no shortage of clubs inquiring about his services, though the asking price on top-end bullpen arms could prove prohibitive for some clubs. To this point, Jeurys Familia (three years, $30MM), Joe Kelly (three years, $25MM) and Andrew Miller (two years, $25MM) are among the relievers MLBTR ranked in Ottavino’s tier of free agency to have cashed in quite nicely. Given his 2.43 ERA, 2.74 FIP, 2.82 SIERA and 13.0 K/9 mark, Ottavino figures to have a fairly high ask, as well. The interest from each of the three teams listed by Morosi has been previously reported, and there are some issues with some of the fits. Adding Ottavino, for instance, could push the Red Sox back into the top tier of the luxury tax bracket. And the Rockies spent more than $100MM on their ’pen last winter, which could make them reluctant to add a fourth reliever on the type of multi-year contract Ottavino should ultimately command. Heyman tweets that infielder/outfielder Josh Harrison has current interest from the Nationals, Reds, Rangers, Giants and Brewers, and he could ultimately generate interest from teams like the Yankees, Phillies and Dodgers — depending on how their pursuits of the market’s top free agents pans out. (Presumably, the Phillies or Yankees would have interest in the event that either failed to land Manny Machado.) Harrison would give the Nats a potential regular option at second base, while the Rangers are in need of a third baseman following the trade of Jurickson Profar. Joe Panik’s stock is down in San Francisco, and the Brewers, too, are in need of an everyday option at either second or third (depending on where they play Travis Shaw in 2019). The fit for the Reds is a bit more muddied, as Harrison would appear to be more of a bench option there, though it’s worth noting that he is a Cincinnati native. Yesterday at the Winter Meetings here in Las Vegas, I sat down with Nelson Cruz’s agent Bryce Dixon for an interview. How are you positioning Nelson Cruz in this market when you talk to GMs? He’ll be the straw that stirs in the drink in the middle of the lineup for you. He changes the entire lineup. When he’s in the middle there, the pitcher has to pitch completely differently and he’s the finishing piece that you know is going to go out there and give you exactly the production that you see on the back of the baseball card that you see every single year. And when he gets into the playoffs, he’s already proven that the bigger the moment, the bigger he shines. You start to look back to some of the bombs he hit in the playoffs for Texas and you know he is a big-time player and he is burning to get back into the playoffs. He thought that the Mariners were going to do it this year. Obviously they fell short, and he was disappointed at that. Clearly he thought they had unfinished business, but the Mariners are going in a different direction so he’ll have to do it with another team. He’s the guy that you plug in every single day in the middle of the lineup and rakes. Apart from that, he’s also a very good influence on the younger players, teaching them not only secrets of hitting, but how to conduct themselves on and off the field. He’s not a guy who is very vocal in the clubhouse. He’s not going to get up and start yelling at guys, but he’s definitely a one-on-one, lead-by-example guy, who’s going to take the younger guys and say, “If you want to be successful for as long as I’ve been successful, here’s how you do it.” That’s kind of how he leads because he’s definitely not a “ra ra” guy, but he’s always working hard, always having fun, and that rubs off on the younger guys for sure. You mentioned a finishing piece. How important is it for Cruz to play for a contending team in 2019? It’s important and I think where he’s at in his career, if you’re not a contender, you don’t really have a need for a Nelson Cruz. So the teams that are in on him want to win. He clearly wants to win and would love to get back to the playoffs and the World Series. He’s got unfinished business as far as that’s concerned. So yes, it’s of utmost importance, he wants to go back to the playoffs. Wherever he signs will be a team that has got designs on making the playoffs. The general assumption is that National League teams can’t be in the mix for Cruz. Would you agree with that? National League teams could be in the mix. He would love to play the field, but the last few years the Mariners have wanted him to exclusively DH. They had a ton of quality, quality outfielders so he didn’t play the field unless it was an NL park. Down the stretch he told the Mariners, end of August, September, “Start playing me more when we play the NL teams because we need to win these games and I know I can help out.” He did well there. He’ll do whatever the team wants, so if an NL team wants to put him in the field, he has no problem with that. Obviously he’s been DH, so the majority of the teams that are after him are American League teams. If you’re looking at AL contenders with DH openings it looks like there are 4-5 suitors, and that feels a lot different than shopping around a reliever who might make sense for 20 teams. Have GMs been trying to leverage that against you? Even though you’re clearly in a smaller universe because of who he is and which teams would have that need, they haven’t because there are enough teams that they don’t want to come in and lowball and try to act like there’s nowhere else for him to go. All 30 teams aren’t in like they would be on a middle reliever type, maybe, but there are numerous teams in so there’s enough to push his market where it needs to go. If there was only one or two, then maybe it would be a different answer. But there’s numerous, so he’s fine where he’s at. In general when you have a free agent, how is it that you decide that you’ve got that last dollar or that the bidding has stopped? The Rays, along with the previously reported Astros and White Sox, have shown interest in free-agent designated hitter Nelson Cruz, per Jon Heyman of Fancred and Jon Morosi of MLB.com. Although Tampa Bay’s not known for throwing money around in free agency, the club currently has cash to play with and a need for a big-hitting presence after designating power hitter C.J. Cron for assignment this past Tuesday. Judging by the offensive prowess Cruz has shown off during his long career, he’d deftly step in for Cron. The 38-year-old Cruz is limited to DH, though, and Marc Topkin of the Tampa Bay Times wrote Saturday that the Rays may want to replace Cron with a player who poses a threat at the plate while also offering some defensive versatility. It’s also unclear whether the Rays would meet Cruz’s potential price (MLBTR predicts he’ll land a two-year, $30MM guarantee), with Topkin noting they might only hand out a one-year, $10MM-plus contract. Despite their need for starting pitching, the Rangers haven’t shown a desire to re-sign free agent Bartolo Colon, according to Gerry Fraley of the Dallas Morning News. Even though he was the majors’ oldest player in 2018, the 45-year-old Colon tallied 146 1/3 innings and recorded the league’s third-lowest BB/9 (1.54) among those who threw 140 or more frames. At the same time, however, the right-hander finished bottom two among qualified starters in ERA (5.78), FIP (5.47) and K/9 (4.98). It was the second straight rough year for Colon, who may struggle to find a contract this offseason as a result. Veteran slugger Nelson Cruz seems likely to draw quite a few looks from American League clubs. Per Jon Heyman of Fancred, the White Sox “are a player” in that market, while the Astros also have some interest. Either club would have some open DH plate appearances for the 38-year-old Cruz, who turned in a .256/.342/.509 slash with 37 long balls this past season in Seattle. That homer total, remarkably, was Cruz’s lowest in the past five seasons. During that time, he’s averaged 41 big flies per season while generally producing 45 percent more offense than a league-average hitter (by measure of OPS+). Houston GM Jeff Luhnow recently discussed a desire to add to an already imposing lineup, and Cruz would certainly fit the bill in that regard. The Yankees’ interest in Patrick Corbin is widely known, though general manager Brian Cashman made the fact a bit clearer at this week’s GM Meetings, writes Ken Davidoff of the New York Post. Asked if the Yankees were interested in retaining lefty J.A. Happ, Cashman acknowledged having spoken to Happ’s agent — though the agent he mentioned, John Courtright, actually represents Corbin. Both players were already locks to be on the Yankees’ radar this winter, so the slip hardly reveals any new information. That said, Davidoff suggests that the Yankees haven’t been deterred by anything they’ve heard from Corbin’s camp yet, adding that Yankees bullpen coach Mike Harkey was Corbin’s pitching coach in Arizona from 2014-15. Harkey, Davidoff continues, has already offered a positive endorsement in Corbin’s favor. Former Astros utility man Marwin Gonzalez is the most versatile defender in free agency this season, and Fancred’s Jon Heyman tweets that he’s garnered at least some level of interest from nearly every club in the game. As a switch-hitter with at least a league average bat and the capability to play as many as six positions (all four infield slots and both outfield corners), “Swiss G” is indeed easy to imagine fitting onto virtually any team’s roster. Meanwhile, former Pirate Josh Harrison, a quality defender at second base with experience at third base and in the outfield corners, has generated some interest from the likes of the Yankees, Reds and Nationals, among others, per Heyman. Both players’ versatility should serve them well this winter. Free agent catcher Robinson Chirinos has drawn some early interest from the Twins and the Braves, tweets MLB.com’s Jon Morosi. The 34-year-old Chirinos hit the market after the Rangers declined his $4.5MM option. Chirinos’ .222/.338/.419 slash was a departure from his career year in 2017, but he did slug a personal best 18 home runs in 2018. Over the past four seasons in Texas, he’s hit .233/.337/.456 with 54 home runs in 336 games played. Chirinos’ strikeout rate at the plate and caught-stealing rate behind the plate both went in the wrong direction this year (in fairly significant fashion), but his track record at the plate is strong for a catcher, even if he’s never been regarded as a great defensive option.